My mother, surprisingly, is not much of a baker. It’s the one thing that bothers me about my love of pastry: I feel like I stole something from her. I feel like I sucked the passion out of something that she took so lightheartedly and which I take so seriously—as a means to survive, really. When I was very young, she had her signatures: strawberry jam thumbprints for my father’s tea; banana bread, a long time favorite of hers; almond danish ring, her most challenging recipe; haystacks, made with peanut butter and those same butterscotch chips I railed against in the last post. Simple things but signatures nonetheless. Sadly, the last thing I remember her baking was a cake from a mix one year when I was in college and couldn’t make it back in advance of Christmas to construct a meal-ending dessert, save for a humble apple crisp. Mom’s cake was a carrot cake—a cake that everyone loves for its moisture but which can be oily and just too moist when it comes from a box. The carrots came compressed in a tin, the raisins in a pouch, and the whole thing was slathered in canned cream cheese frosting that was more sugar than cream cheese. I cringe. I certainly acted like a brat that holiday, defiling the cake in front of my grandparents and making every effort to dissuade family members from eating an artificial confection. It may have looked fancier than my homey little dessert, I thought, but at least the crisp was made with real, wholesome ingredients and fresh fruit. Why couldn’t I have just kept my mouth shut? But when I look back and think about the heyday of my mother’s baking, the first thing that comes to mind is not the danish or the haystacks, but Swedish Apple Pie. It’s a “cheater’s apple pie,” really, but there’s no denying that it’s a crowd-pleaser. Dollopped with spiced batter, it’s one of those magical fruit desserts that makes it’s own upper crust which, if done just right, gets nice and crisp on the top. We ate that “pie” at the end of nearly every single celebratory meal. Although it was always OK, it just became boring. It was both my languor and the influence of my sweet grandfather’s affinity for “real” apple pie (second only to his love of this one) that gave me this folksy appreciation for a good ol’, double-crusted apple pie—that mile-high, statuesque, dare I say it, “All-American” (ugh) thing. It’s hard to resist; the scent of spiced fruit and butter wafts from its steam-vent chimney, beguiling those within a 500-foot radius of the oven. Unlike some pies which I can eat warm or at room temperature, I can only enjoy apple pie heated and only alongside a scoop of vanilla ice cream, melting from the neighboring heat–no apple pie à la mode for me. (The ice cream makes the top crust soggy, which, if you know my crust convictions, you know that would make me very grumbly. 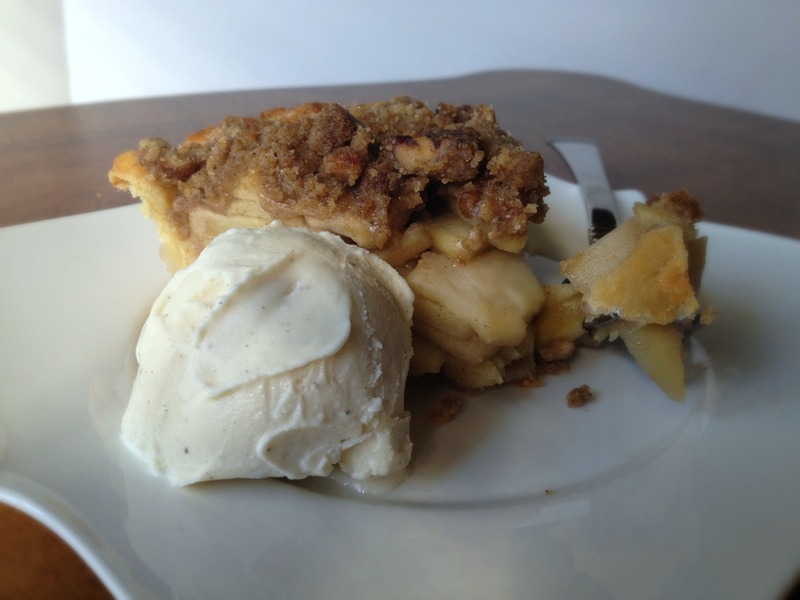 A variation of this, the apple crumb pie, though, never appeals. I like other “crumbed” desserts—crisps, tarts, shortbreads—but apple pie, to me, doesn’t need adornment. I never tire of the way a crisp, buttery pastry crust shatters under the fork into a juicy fruit filling. And an apple pie doesn’t need any additional sweetness. I like the natural, complex sweetness of the fruit to shine through. …Until last spring. When I was testing crust recipes, I didn’t just want to make the same pie each time. I made a very unseasonal pecan and pumpkin because I had many of those core ingredients around. And then, I shamefully bought pounds of Chilean apples to make an apple pie, but with only a single round of dough left before I was comfortable with my working recipe, I decided a single-crust crumb pie was finally in order. I was trying to think of ways to tweak the classic ingredients to my liking when it came to me: browned butter. I thought a very nutty-tasting crumb bound with melted and cooled browned butter just might give my apple pie a toasted, roasted flavor I could get behind. Add dark brown sugar for molasses-y depth, chopped pecans, and a lot of salt, and I had, what I thought, was an elevated, but still very homey apple pie. When this fall blew in I couldn’t wait to make it again and had to keep putting it off. I thought it would be fitting that the first thing I actually baked after my hiatus was a pie. I used the seasonal apples I thought would work best with this particular pie. They each have meaning: The Granny Smiths aren’t grown locally, but they’re essential since mushy slices, stripped of their integrity once baked are not worth eating. I also wanted to use apples that had a lot of zing and character since my crumble is sweeter than a traditional pastry crust. 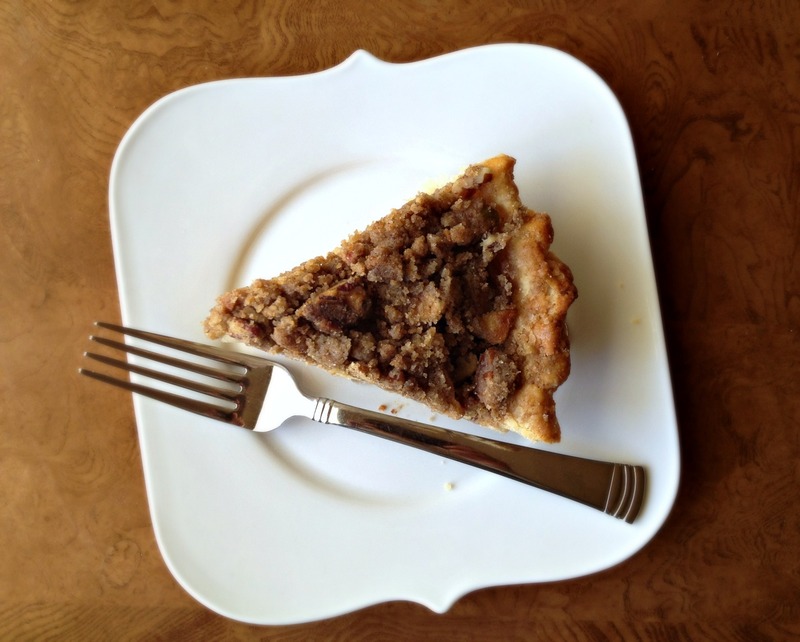 The apples had to sparkle as a bright counterpoint to the rich, nutty crumble. The Mutsus hold just as firm as the Grannys but they add more depth. To me they’re tart-sweet with notes of honey, pear, and even champagne. They’re hilariously huge and one of my favorite eating apples. If Mutsus aren’t available, Empires hold up very well in the pie as well and at least bring a tart note that’s less severe than that of the Grannys. For folks who don’t have access to these apples (and since apple season is on its way out), I recommend finding something like a Jonagold or a mix of primarily Grannys with a smattering of Golden Delicious(es?) to counter them. A bite of this pie is humbling. It’s simultaneously a bite of that Christmas crisp, my mother’s Sweedish Apple pie, and my grandfather’s beloved two-cruster. I hope to make this special pie for Thanksgiving and see what the family thinks. See recipe notes for more on the baking of this pie. The crust for this pie is blind-baked and sealed with egg wash, because I cannot stand pies without crisp, flaky bottoms. While this may seem like a lot of work for an apple pie. Baking whole pies on a preheated baking sheet (or, better yet, a baking stone) at a higher temperature for the first 20 minutes is a tactic I usually use when I don’t have the luxury of making a single-crust pie, and this recipe can be adapted to fit that model. Feel free to comment or email if you want advice on how to do this. And to prevent the opposite problem (burning due to the blind baking) I put the pie back in the oven on a cool baking sheet. I love macerating and reducing the juices to a sticky apple caramel to intensely flavor my pies, and again, keep them from turning soggy. I recently found out that Rose Levy Beranbaum is famous for this technique that I’ve been using for ages, and I reconciled our two approaches in this recipe. It really is the answer to apple pie woes. Use top of pie plate to trace circle 2 inches larger than plate on aluminum foil. Cut out circle and remove small, 1-inch circle from center of foil (to simulate top crust). For the crust: Roll out crust to 12-inch round and fit into pie plate, making sure to press into corners and down sides without stretching. Fold edges underneath and crimp or flute as desired. Freeze for at least 40 minutes. Adjust oven rack to lower-middle rack. Preheat oven to 375 degrees. For the topping: While crust is in the freezer, melt butter in small, light-bottomed saucepan over medium-low heat. Once melted, continue to cook, stirring occasionally until milk solids have turned dark brown, liquid golden, and butter smells of toasted hazelnuts, about 10 minutes. (Whisk constantly during the last 3 minutes.) Pour into bowl and set aside until cool. Using a fork, mix to combine flour, pecans, granulated sugar, cinnamon, and salt. Add dark brown sugar to bowl, breaking it up between fingers; mix to combine. When butter is cool, pour over dry ingredients and use fork to mix until everything is dampened. Continue to mix, pressing clumps of moist ingredient together to create clumps and “bolders.” Transfer to refrigerator. For the filling: In small bowl, mix together granulated sugar, dark brown sugar, cinnamon, lemon zest, salt, and allspice. Pour about half of apple cider vinegar into very large bowl. Peel, core, and slice apples 1/4–inch thick, adding them to bowl as you go. Halfway through, pour in remaining cider vinegar. Continue to fill bowl with apples. Add sugar mixture to apples and toss thoroughly to coat all apple slices. Set filling aside for at least 1 hour and up to 3 hours. Remove pie shell from freezer and line with aluminum foil. Fill with pie weights or beans (not rice) and bake for 20 minutes. Remove foil and weights, press down any puffed up crust with back of spoon and return crust to oven for 5 minutes. Remove crust from oven and brush bottom and sides with egg white. Return to oven for 1 minute. Transfer to wire rack and let cool completely. Meanwhile, drain liquid exuded from apples into glass measuring cup. (You should have ½ cup juice; if not let, apples sit longer.) Toss apples with cornstarch until dissolved. Transfer juice to small saucepan and boil on medium-high heat until reduced to 1/3 cup. Pour “caramel” into bowl of apples and mix to combine. Transfer to blind-baked shell, mounding apples slightly in center. Stir together egg yolk and heavy cream in small bowl and brush on crimped crust rim. Cover apples with prepared circle of foil and bake on baking sheet for 30 minutes. 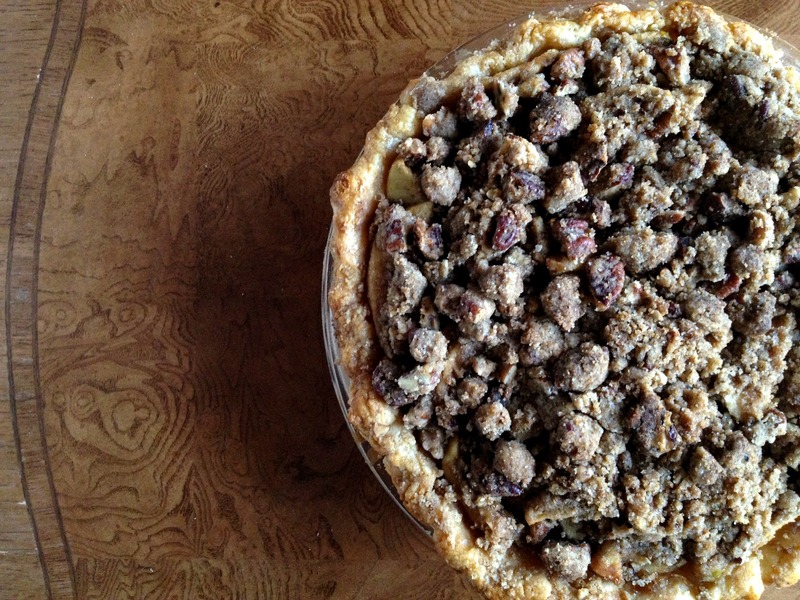 Remove pie from oven, discard foil circle and cover with crumb topping, breaking up extra-large chunks. Cover crust rim with pie shield or foil ring. Bake for about 40 minutes or until topping is brown, filling is bubbling, and apples are tender (but still crisp—no applesauce mush in my pie thank you). Transfer pie to wire rack and let cool for at least 3 hours before serving. After day 1, pie is best heated (to recrisp topping). Everyone says things they regret to their nearest and dearest – it’s what families are for! And I’m sure they all love that you bring home these incredible desserts. 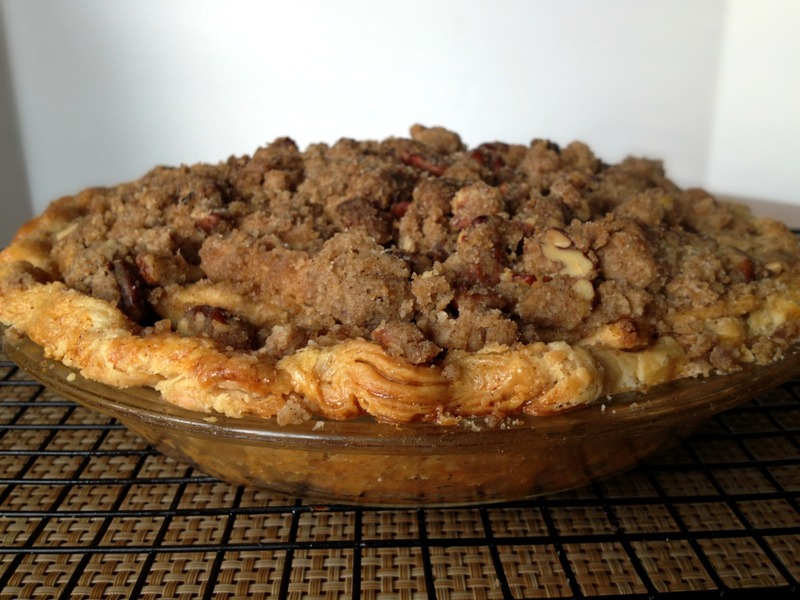 I love the idea of salty, nutty, browned butter apple pie – de-licious! love a good apple pie, but i’ve never done a “traditional” one :) i actually tend to go for the crisp topping, just for ease, but i love how you made this one much richer! it’s fun to think of how many family memories are centered around food… i’m sure you’ll create a few more this thanksgiving with this pie!